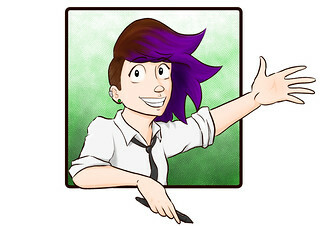 I'm an Australian webcomic creator and illustrator. My main comic project is Daemon. The story revolves around Billie Hunter, a teenager who is completely oblivious to her daemonic lineage. After a tragedy she suddenly grows horns and finds herself swept up into the world of the daemon! She’s expected to learn magic and combat, and to work against the enemy – Angels. Unfortunately the world isn’t as black and white as human mythology likes to suggest. Figuring out who is really good, and who is really evil might not be as straightforward as you think! You can read Daemon for free on Tapas, Smackjeeves or Webtoon. No matter what country you’re in, you can pledge on Patreon. Pledges are charged in US dollars on the first of the month. You can change or cancel your pledge at any time. Money goes towards art supplies, like pens, paper, and inks! It also helps me create new merchandise & printed work, and goes towards tabling at markets and conventions so I can meet fans in person! If Patreon isn't your thing, you can also support me by subscribing, liking, and sharing my pages. Stay ahead of the crowd with early access to pages of Daemon! 2 weeks ahead of what is published anywhere else! Access to the Patreon only feed! This includes exclusive work in progress pictures, polls, rewards from goals met, and once in while exclusive coupon codes for secret Etsy sales! ⦁ Whenever I publish a new zine I will post it here in a digital format for you! Read them first before everyone else, and don’t pay for postage! Yay! ⦁ Read my new webcomic about the aspiring punk-rocker Merlin and his exploits to become the next big superstar! Merlin and the Crystal Swords updates ad-hoc and is (currently) only available to read on Patreon. ⦁ Concept art for comics! This includes concepts for Daemon, as well as MATCS and other comics that I may work on while you’re my patron! I will post at least one piece each month and will keep it spoiler-free! ⦁ A square digital commission! Bust only, full colour & shading, 1200 x 1200px, 300 DPI – I will also provide a smaller web-friendly version so you can use it on your social media pages. The style of these commissions will be similar to the characters in Daemon. Please note: It's your responsibility to get in touch to request your reward each month. Work will start on your commission after your pledge has been charged on the first of the month. You cannot save up your rewards to cash in later unless we discuss it first! Art is not for commercial use and must be credited when used online. I do not take sketchcard commissions anywhere else – You can only get these through Patreon! Please note: It's your responsibility to get in touch to request your reward each month. Work will start on your commission after your pledge has been charged on the first of the month. Size of the cards are about 6.3 x 8.9 centimeters.